Astronomers have revealed one of the most powerful black holes known. The black hole is located in the center of a galaxy cluster named RX J1532.9+3021. Supersonic jets from the black hole have created large, expanding cavities in the hot gas. Energy from the cavities keeps the hot gas from cooling and forming trillions of new stars. Astronomers have used NASA's Chandra X-ray Observatory and a suite of other telescopes to reveal one of the most powerful black holes known. The black hole has created enormous structures in the hot gas surrounding it and prevented trillions of stars from forming. The black hole is in a galaxy cluster named RX J1532.9+3021 (RX J1532 for short), located about 3.9 billion light years from Earth. 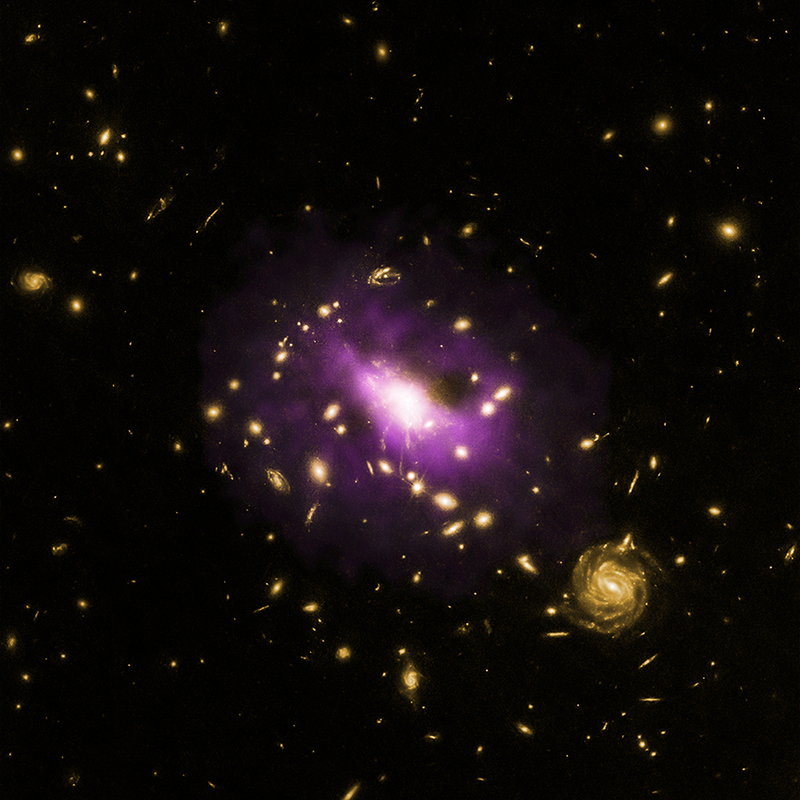 The image here is a composite of X-ray data from Chandra revealing hot gas in the cluster in purple and optical data from the Hubble Space Telescope showing galaxies in yellow. The cluster is very bright in X-rays implying that it is extremely massive, with a mass about a quadrillion — a thousand trillion — times that of the sun. At the center of the cluster is a large elliptical galaxy containing the supermassive black hole. The large amount of hot gas near the center of the cluster presents a puzzle. Hot gas glowing with X-rays should cool, and the dense gas in the center of the cluster should cool the fastest. The pressure in this cool central gas is then expected to drop, causing gas further out to sink in towards the galaxy, forming trillions of stars along the way. However, astronomers have found no such evidence for this burst of stars forming at the center of this cluster. This problem has been noted in many galaxy clusters but RX J1532 is an extreme case, where the cooling of gas should be especially dramatic because of the high density of gas near the center. Out of the thousands of clusters known to date, less than a dozen are as extreme as RX J1532. The Phoenix Cluster is the most extreme, where, conversely, large numbers of stars have been observed to be forming. What is stopping large numbers of stars from forming in RX J1532? Images from the Chandra X-ray Observatory and the NSF's Karl G. Jansky Very Large Array (VLA) have provided an answer to this question. The X-ray image shows two large cavities in the hot gas on either side of the central galaxy (mouse over the image for a labeled version). The Chandra image has been specially processed to emphasize the cavities. Both cavities are aligned with jets seen in radio images from the VLA. The location of the supermassive black hole between the cavities is strong evidence that the supersonic jets generated by the black hole have drilled into the hot gas and pushed it aside, forming the cavities. Shock fronts — akin to sonic booms — caused by the expanding cavities and the release of energy by sound waves reverberating through the hot gas provide a source of heat that prevents most of the gas from cooling and forming new stars. The cavities are each about 100,000 light years across, roughly equal to the width of the Milky Way galaxy. The power needed to generate them is among the largest known in galaxy clusters. For example, the power is almost 10 times greater than required to create the well-known cavities in Perseus. Although the energy to power the jets must have been generated by matter falling toward the black hole, no X-ray emission has been detected from infalling material. This result can be explained if the black hole is "ultramassive" rather than supermassive, with a mass more than 10 billion times that of the sun. Such a black hole should be able to produce powerful jets without consuming large amounts of mass, resulting in very little radiation from material falling inwards. Another possible explanation is that the black hole has a mass only about a billion times that of the sun but is spinning extremely rapidly. Such a black hole can produce more powerful jets than a slowly spinning black hole when consuming the same amount of matter. In both explanations the black hole is extremely massive. A more distant cavity is also seen at a different angle with respect to the jets, along a north-south direction. This cavity is likely to have been produced by a jet from a much older outburst from the black hole. This raises the question of why this cavity is no longer aligned with the jets. There are two possible explanations. Either large-scale motion of the gas in the cluster has pushed it to the side or the black hole is precessing, that is, wobbling like a spinning top. A paper describing this work was published in the November 10th, 2013 issue of The Astrophysical Journal and is available online. The first author is Julie Hlavacek-Larrondo from Stanford University. The Hubble data used in this analysis were from the Cluster Lensing and Supernova survey, led by Marc Postman from Space Telescope Science Institute. NASA's Marshall Space Flight Center in Huntsville, Ala., manages the Chandra program for NASA's Science Mission Directorate in Washington. The Smithsonian Astrophysical Observatory in Cambridge, Mass., controls Chandra's science and flight operations. Coordinates (J2000) RA 15h 32m 53.80s | Dec +30° 20´ 57.60"
It just tells me how little we know, how primitive our observations. Amazing. I didn't know black hole could get so immensely huge. Amazing. I can't understand the energies involved. Are we saying the matter is moving at light speed? I have a question, don't the other galaxies in the picture emit X-rays as well? It looks like the surrounding galaxies are slowly being pulled into it. I wonder what the magnetic pull looks like on this. Actually do we have devices to view magnetic fields on the fly in real time? It is still hard for me to get my mind around all that information. it is so interesting. It would even be hard for me to understand how those figures were calculated. Good work. This is certainly the most massive and powerful Black Hole I have ever seen in the past ten years. Remarkable contributions by Astronomers, and the Chandra Image of the Black Hole is outstanding. A galaxy cluster located about 3.9 billion light years from Earth. About 3.9 billion light years from Earth. 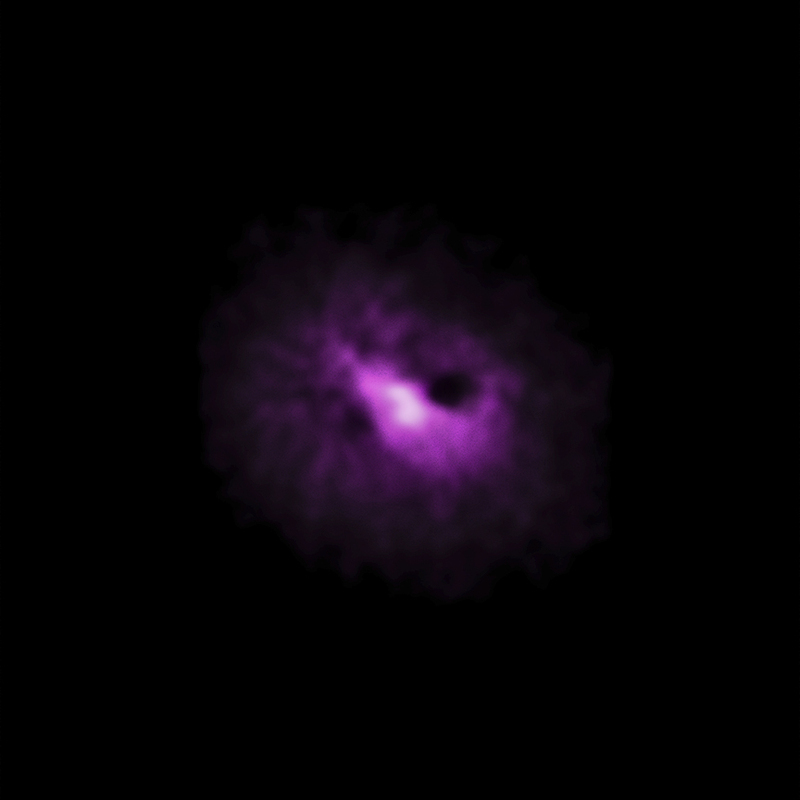 Combining X-rays from Chandra with optical data from the Hubble Space Telescope. About 1.6 million light years. X-rays are purple and optical yellow. In the constellation Corona Borealis in the Northern Hemisphere..